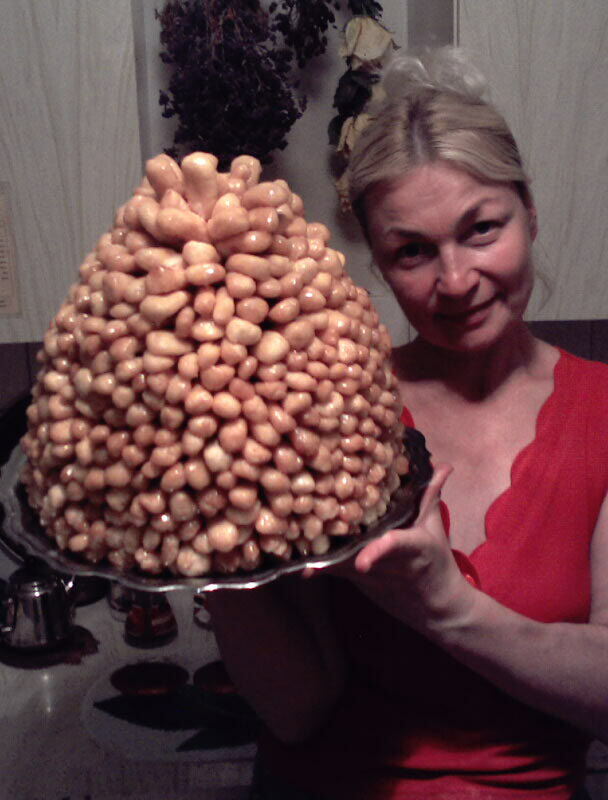 It is particularly popular in Tatarstan and Bashkortostan, and is recognized as Tatarstan's national sweet. Chak-chak is made from unleavened dough cut and rolled into hazelnut-sized balls, which are then deep-fried in oil. Optionally hazelnuts or dried fruits are added to the mixture. The fried balls are stacked in a mound in a special mold and drenched with hot honey. After cooling and hardening, chak-chak may be optionally decorated with hazelnuts and dried fruits. On 1 kg of wheatflour : 10 eggs, 20-30 g of castor sugar, salt; 500-550 g of oil; 0,9-1 kg of honey, 150-200 g sugar; to adorn a 100-150 g of fruit drops.